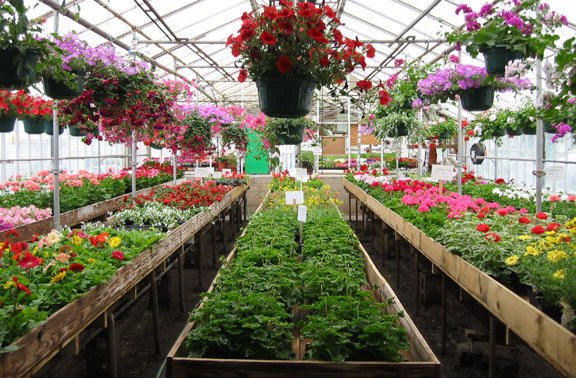 Sales area with potted annuals and hanging baskets. 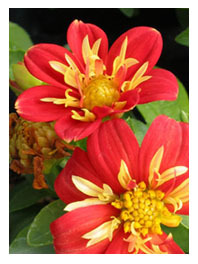 Our annual flowers are available in either packs or pots. Packs now contain 3 or 4 plants. Our selection of potted plants, hanging baskets, planters, herbs and many vegetables can be found in the front greenhouse / sales area. There is also a sampling of our annual flower packs in the sales area for the convenience of customers with limited time or mobility. For a larger selection of annual packs, continue past the sales area to the hoop-house beyond. In between these two greenhouses, you can find the perennials and the rest of the vegetables.